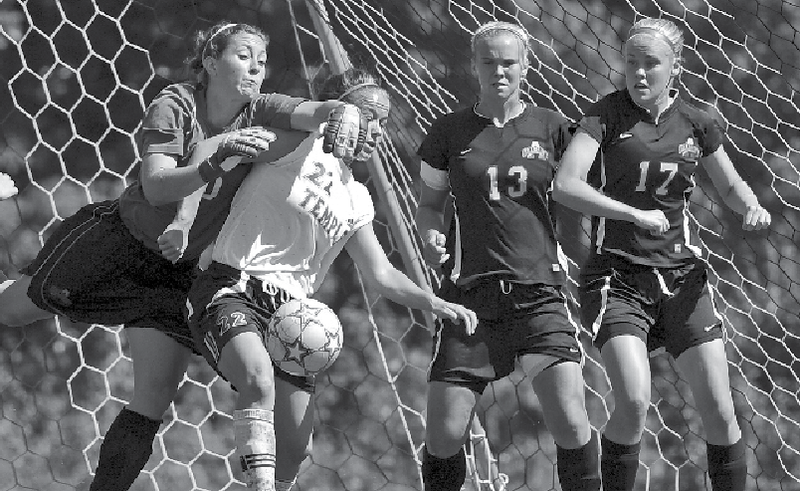 The women’s soccer team lost, 2-1, to Rhode Island on Sunday. The Owls have now lost four straight. JOHN BIRK TTN Junior forward/midfielder Stephanie Ferretti fights for a loose ball against Albany Great Dane defenders on Sept. 13. After starting the season 4-1-1, the women’s soccer team has dropped four in a row and all of a sudden finds itself in last place in the Atlantic Ten Conference. Entering the conference home opener against the Rhode Island Rams, Temple was hoping to regain some of the defensive prowess that led to a successful start to the season. After winning their first three games at home, the Owls went on the road, only to be outscored 9-2 in three losses. The last loss in the road trip came at the hands of A-10 rival Dayton. The Owls lost 4-0 to the Flyers on Friday, putting their A-10 record at 0-1. When the Rams (3-5-1) visited the Ambler Sports Complex on Sunday, Sept. 27, the Owls were presented with an opportunity to bounce back from the opening loss against the Flyers. Unfortunately, it was not to be, as the Rams came out firing, ultimately winning 2-1. Sophomore forward Stephanie Santos scored the first Rhode Island goal. She took a pass from senior Ina Bjorklid and sped downfield. Temple junior goalkeeper Kara Williams moved out of the net to challenge Santos but slipped due to the wet field conditions. Santos took advantage of a lucky bounce and beat two Temple defenders to put the Rams up 1-0. Following a goal from Rhode Island sophomore midfielder Alexis Veith, the Owls entered the break down 2-0. In the second half, the Owls displayed a more aggressive style of play, and they managed to draw 12 penalties in their favor. The Cherry and White made a game of it at the 61:21 mark, when junior forward Stephanie Ferretti headed in her third goal of the year off a corner kick. The second-half surge was not enough, though, as the Owls would fail to tie it up. In the end, it was too little, too late, Jones said. Sophomore forward Niki Conn was held goalless for the fourth straight game after starting the season with six goals in her first six games. Despite Conn’s cold streak, the Owls need to find a way to score the ball, Jones said. Even though the Owls have lost four games in a row, Jones remains confident his team can turn it around. The team will attempt to right the ship when it travels to Richmond on Friday, Oct. 2 to play the Spiders. Sophomore defender Natalie Druehl matched up against her sister competitively for the last time in Temple’s 1-0 loss to Connecticut on Thursday.